Can I use my songs and media from Version 4? Yes, songs, images and most file types are compatible between Version 4 and 5, with one exception: The equivalent of the display schemes in Presenter 4 (.P4Ds extension) now have a .PrDS extension and are not directly compatible. Version 5 includes a substantial collection of songs and other media as part of the installation. All media is stored in a location totally independent of previous versions of Presenter (3 and 4). If you have Presenter 4 installed, you will see these two folders side by side. 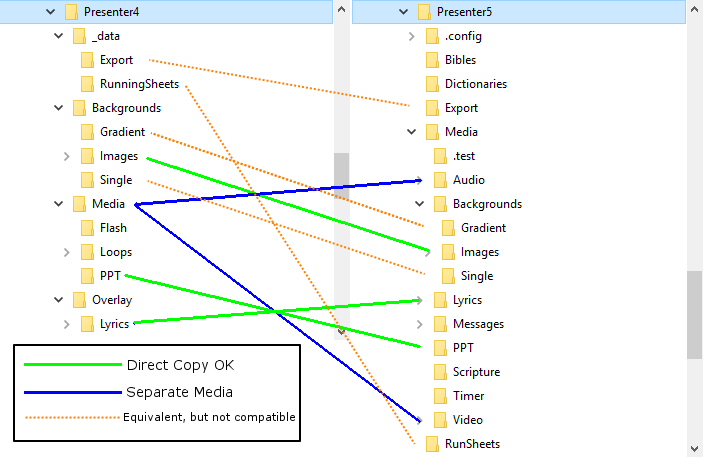 The Media subfolder contains the relevant content for each file type. You can open the File Explorer from within the browser for each section and also drag and drop files into the browser (if a folder is selected). ⟵I have purchased a Bible Module for V4. Do I need to buy it again?